Shanghai city is doing efforts to improve its population’ dietary habits. In recent years, the threat of chronic diseases related to dietary nutrition to residents’ health has become increasingly prominent. Shanghai Municipal Center for Disease Control and Prevention launched the “Monitoring of Diet and Health Status of Shanghai Residents” in 2012-2017. The result is a Monitoring Report of Diet and Health Status of Shanghai Residents (2012-2017)” which show that the dietary structure of Shanghai residents is not reasonable, mainly due to excessive intake of livestock and poultry meat, oil and salt, and insufficient intake of cereals, fruits, vegetables, milk and soybean. This lead to both nutrient deficiency and nutrient excess issues. Overweight and obesity problems are becoming prominent, also amongst children and teenagers. The Monitoring Report also shows that – compared with the recommended intake by Chinese Dietary Guidelines (2016) – Shanghai population has an excessive intake of livestock and poultry meat, cooking oil and salt. In general, from 1982 to 2012, the intake of livestock and poultry meat, fruits, milk and soybeans, cooking oil had risen, while intake of other foods had declined. In this scenario, Shanghai Health Promotion Committee (a department of Shanghai Municipal Health Commission) published a Dietary Knowledge Reader aimed at guiding the public to to improve the nutritional status of Shanghai residents and reduce or prevent the occurrence of chronic diseases through a better diet. The Reader is divided into seven chapters. Chapters 1 to 5 respectively focus on five types of food: cereals and tubers, vegetables and fruits, fish, poultry, meat, eggs and other animal foods, milk, soybeans and nuts, cooking oil and salt. Each chapter explains the suggested average daily intake of food for Shanghai residents, the nutritional elements of each type of food, and some suggestions for healthy cooking and eating those foods. The Monitoring Report shows that the average daily intake of cereals and tubers per adult in Shanghai are 189.6g and 14.5g, which are 30.5% and 71.0% lower than the recommended intake. From 1982 to 2012, their intake decreased significantly. Cereals and tubers are the main sources of carbohydrates and various nutrients. The Dietary Guidelines for Chinese Residents (2016) recommended that adults should consume an average of 250-400g of cereals and tubers per day. Refined rice and noodles lose about 70% of the vitamins, minerals and most dietary fiber in rice and wheat, so the Guidelines promote eating wholegrains, mixed beans and tubers. 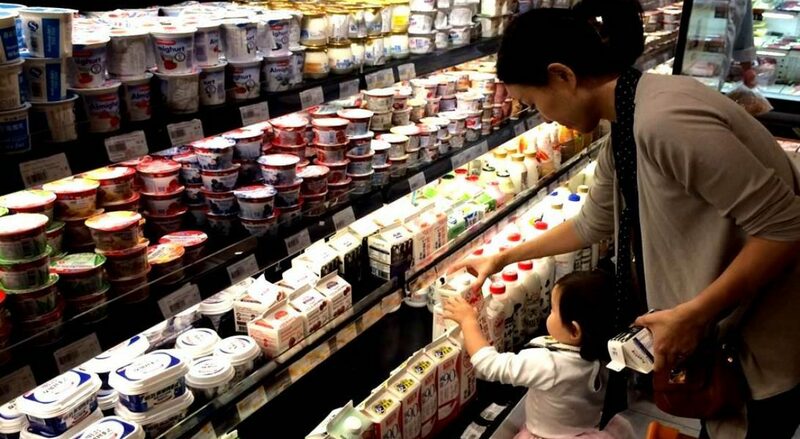 The Monitoring Report shows that the average daily intake of milk per adult in Shanghai is 97.2g, which is 67.9% lower than the recommended intake. From 1982 to 2012, the intake of milk in Shanghai residents has risen. Milk (as well as other dairy products: yoghurt, cheese, milk powder, etc..) is a good source of protein and calcium. Adults should take in milk and dairy products equivalent to 300g of fresh milk every day. People who are lactose intolerant can drink milk in separate sessions (no more than 250ml at a time), or switch to yogurt, but shall not drink milk on an empty stomach. When choosing yoghurt, consumers should pay more attention to the content of protein and carbohydrates, and thickeners added within the national standard will not affect human health. Chapter 6 is about sports and drinking water. This chapter points out that the adult population and overall overweight obesity rate in Shanghai is 44.1%, and that of children and adolescents is over 25%. In order to promote energy balance and maintain good health, the chapter recommends that we should develop the habit of daily exercise, drink 7 to 8 cups of water a day, and drink less sugary drinks. Chapter 7 is about how to balance the nutrition, taste and safety in daily diet. This chapter suggests, amongst others, minimize the consumption of foods that contain food additives. It also encourages consumers to cook food at their home as much as possible. May I suggest that the government should support providers of healthier food products that cut down the % on people with Non Contagious Diseases. The cost of non contagious diseases to the public health system is 100 times greater than the provision of zero % VAT and Zero % Import tax on monounsaturated food oils. Monounsaturated oils would reduce over 5 years the population effected by non contagious diseases such as cardio vascular disease by 40% and who know how many wound not be diabetics or victims of cancer. It’s not a big ask. Over 67 countries are pushing to increase the availability of monounsaturated oils. It makes sense. As these monounsaturated oils could then compete with the cheap palm and Polyunsaturated oils that have a much higher trans fat content in foods exposed to high temperatures, air and water.